The laws of real estate and curb appeal tell us that given the choice of two different exteriors, one with a gray expanse of concrete outside and the other decorated with lush greenery and blooming flowers, people will be drawn to the more welcoming view. The same follows for consumers looking for a place to dine. For Ron E. Green, president and founder of Another Broken Egg Cafe, a breakfast-focused chain with two company-owned stores and 31 franchise locations, landscaping has long been a passion. The first restaurant he opened in 1996 in Mandeville, La., had gardens, waterfalls and pots gurgling with water. Green believes the landscaping had a lot to do with bringing in those early guests and has helped set the cafe on the path to become the fast-growing company it is today. “I think it was one of the key ingredients to becoming such a valued spot,” he says. Green encourages his franchisees to install and maintain landscapes around their locations, when possible. 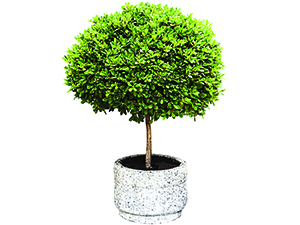 Some units are located in shopping centers or places where landlords already handle landscaping, and so they are not able to add plants of their own. “Many have been able to do a little bit of landscaping,” Green says. Where cost is a concern, he recommends planters to add color and life to the front of the restaurant. “Quality pots [still] can be quite expensive,” he acknowledges. “You could spend $1,500 on five or six large containers.” The initial expense may be worthwhile, though, when you don’t have to constantly replace planters down the line, Green says. Those Another Broken Egg franchisees that use gardening services to install and maintain their greenery can spend between $500 and $1500 on the initial planting, depending on the size of the lot. Green estimates the monthly cost for professional maintenance runs between $55 and $200. Irrigation systems help keep maintenance to a minimum at some of Green’s cafes, thanks to drip systems that automate the watering. “We put them on a timing system that waters in the morning and late afternoon, and we fertilize every six weeks,” he says. “The plants do tremendously well.” He also trains staff to take care of the greenery around the restaurant. This approach folds the responsibility for the plants into the routine care and cleaning process for the restaurant and helps reduce ongoing maintenance costs. Green says it’s hard to measure the ROI from landscaping, but he believes it creates a strong, positive first impression, and that makes it worth the expense. “That entrance is the first step to establishing the quality of your restaurant. It pulls customers in. It’s a priceless thing. You can’t really put a value on it,” he says. When guests arrive at Golden Corral franchisee Anthony Verderame’s restaurant in Bradenton, Fla., they see leafy green trees, bright blossoms and fresh mulch carefully laid out between plants. Verderame operates five Golden Corral locations, and he takes great pride in his landscaping. He pays a service to trim palm trees, lay down mulch and install fresh plants seasonally. “Curb appeal to me makes a world of difference. If I go to a restaurant and it looks messy outside, I’m already thinking the inside is messy,” he says. Verderame spends between $2,500 and $3,500 per restaurant per year to have flowers planted and the landscaping maintained. “Everybody notices the flowers. It makes me happy, and it makes my customers happy. It’s part of doing business,” he says. His customers often compliment the staff on the landscaping and inquire if the seasonal flower-bed plantings are delayed due to weather, so he knows they are paying attention to the exterior look of his restaurants. Part of the motivation to invest in landscaping is knowing what his guests expect from a restaurant experience. “A lot of my customers are elderly people, and they love to see the maintenance. They like to see it nice and crisp,” says Verderame. He keeps costs under control by using professional landscapers who are knowledgeable about what plants and flowers do well in the Florida climate, especially during the challenging hot summer months. Well-adapted plants don’t need to be constantly replaced, he says, and that saves money. Verderame considers landscaping costs to be part of his overall maintenance budget, fitting right in with regular tasks like pressure washing the sidewalks and cleaning the carpets. Whether a restaurant’s landscaping budget covers planters and flowers like some of Green’s locations, rotating beds of flowers like Verdarame’s or greenery inside and out, the goal is the same: to beckon customers into the place. There’s an option for every budget, these operators say, and creating curb appeal doesn’t require a lavish outlay of cash to attract guests.